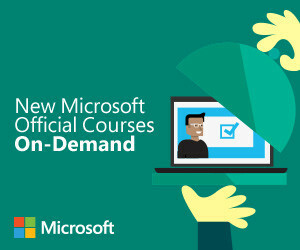 Microsoft Official Courses On-Demand are complete courses in a self-paced online format, hosted by Microsoft and streamed directly to you. The courses combine videos, reading, hands-on labs, and knowledge checks to help you build your Microsoft technology skills — on your own schedule, at your own pace and in your own place. Microsoft On-Demand courses are structured similarly to instructor-led MOC for the classroom, with similar pacing and objectives covered within a course. With Microsoft-authored, high-quality, accurate content, successfully completing a MOC On-Demand gives you solid credentials as you grow your IT skills and your career. MOC On-Demand is an ideal solution for busy, time-constrained professionals. You can work on your course at any time throughout the 90-day period after you purchase and activate the course. Attending a Microsoft Official Course has never been easier! Select the course you need, fill in the form below and pay online. We will contact you and send you the online course on the same day or the next working day. I did not find the course I need. Please contact me. Fill this ID when you use FPS apps to transfer your payment. Please keep the receipt / SMS to prove your payment. Please keep the receipt from PayPal to prove your payment. We understand our standard offers may not fully meet your specific needs, but we are ready to provide customized solutions. Click the box on the right to leave your message or give us a call directly at (852) 3605-3322.